Database management software is a computer software application that facilitates to definition, creation, querying, update and administration of the database. Also, there should be several actions to prevent data loss and unsecured access to the stored data. There are several database management software to cater to these requirements. DATAPINE facilitate to create and manage database which is created using multiple existing databases, data saved with external applications and data available with several hundreds of excel files. Secure access to data with few clicks. Native connectors to several industries leading relational databases including Google Analytics, Google Spreadsheets, SAP ERP/BW. Drag and drop interface is to visualize data for any team member. Predefine queries to make easy access to data in common type of requirements. Powerful filters to existing data. Possibility to perform an advanced calculation with existing data. Use excels expressions and modify text, date fields with ease. Run custom SQL queries and drag and drop query build facility. Support for all common dialects. Customizable dashboard according to the focus industry. 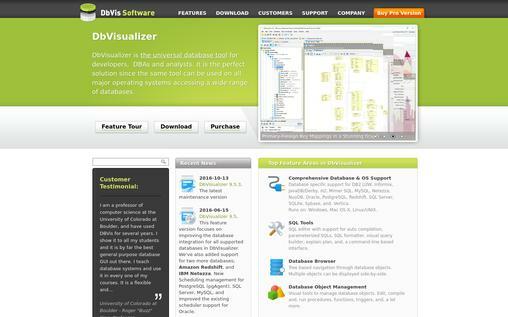 DbVisualizer provides facilities for development of databases, Analysis, and database administration. Configurable key binding with pre-defined key maps. Drag and Drop facility to re-arrange tabs of the user interface. Double click allows maximizing tabs of user interface. Facility to detach tab in separate window of user interface. Possibilities rename tabs in user interface and arrange according to company terminology. Save layout of rearranging object for each session. Dynamic JDBC drive management connection without manual CLASSPATH editing. Basic password security and strong master password security, master password users have visibility to all basic passwords. Connect single or multiple connections with a single click. Tree structure to manage database objects. Multi-object support for database related activities like open, drop, connect, etc. Database specific support for all available leading databases and generic database support. All activities related to the database tables like create, alter, rename, drop, empty, etc. Create, edit and execute facility for procedures functions, packages and triggers to use with database tables. Support BLOB, CLOB and binary data. Export table data, formats and custom data format setting. Syntax-colored SQL editor to execute Single and multiple SQL scripts. Predefine and users define SQL scripts with procedure support. Result set management facility with auto/manual column resizing. 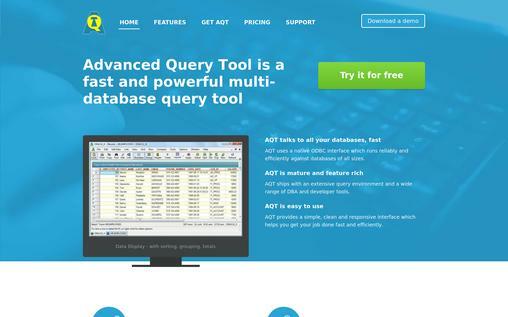 Query builder to create queries with few clicks without SQL expertise. Support all kind of charts. Task management and memory monitoring to ensure database is running on define parameters and allows taking early action before database crashes. Command line interface for advanced technical users. ManageEngine Applications Manager is a tool that monitors the databases to ensure it is running with all required parameters to ensure highly available service and performance. Multi-dimensional analysis on Oracle database performance with monitoring reports and performance metrics to analysis server usage, health, and server availability. Monitor the growth of data files and generate alarms on specific parameters to perform early corrective actions when data file size exceeds the threshold. Real-time monitoring on tablespace growth and graphical display the available free space. Also possible to configure alarms to ensure early notifications. Oracle ASM Disk Groups monitor with full drill-down capability to the ASM disk group and ASM disk level. Database performance monitoring according to specific business metrics and generate alarms on predefine parameters. Schedule jobs to execute in database for identified predefine actions and monitoring requirements. Mobile web client and iOS/Android apps to ensure connectivity all the time you required. 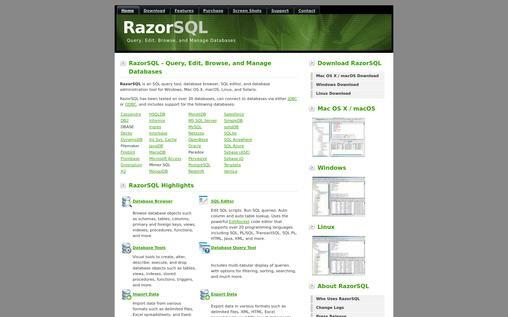 RazorSQL is an SQL editor and database query tool that facilitate browse database objects and manage the database using the set of features. The tool is compatible with Mac OS X, Windows, Linux, and macOS. Inbuilt different connection features to connect each type of available databases without any manual configuration. No end user configuration required. Automatically copy table and queries from a foreign database to local database for selected data types. Tree structure navigation to database objects. Single click visible and search facility to table and view data. Easy steps to create SQL select statements, insert, update and delete queries. SQL editor with the highlighted syntax for scripting languages. Searchable, sortable and filterable query results in the multi tabular display. Possibility to create custom user template or use built-in templates. Facility to create, Alter and drop database table and views. Data import facility to tables from delimited files, Excel files, or fixed width files. Comparing facility to table data or query results. Command line interface for advanced users. 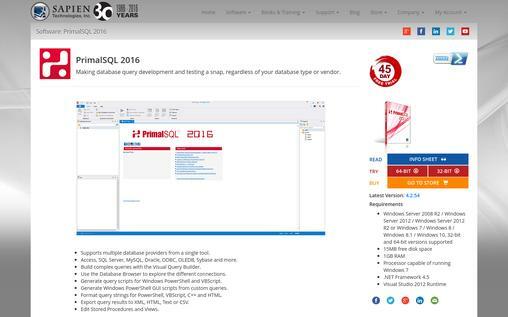 PrimalSQL is not specially design to and specific database vendor. So it is flexible to use with any selected database. Possible to connect simultaneously any number of databases without considering a vendor or the connection type. Ad-hoc queries and data editing support. Possible to export query result to CSV, HTML or XML file formats for further use outside of the database. Query editing facility is simply as text editing to make the process easy. Facilitate to export script as PowerShell or VBscript and save as a file to use later. Advanced Query Tool is MS windows based tool which is mainly designed to use by database administrators and database developers to create, manage and perform several activities. The tool is vendor independent and it is flexible to use with any type of database. Database explorer facility makes sure to display all the objects in the database with a tree structure when you log into a database. Each object details can obtain from a simple right-click option. Find object function to search on the database for the specific object using a piece of text. Possibility to add queries, Charts, saved the result as favorites. Facility to add own description to an object. Query builder is to simplify the query building process with the advance option like table joints. Possible to create the user define relationships to later use. Form type window to create complex where clauses and it prevent syntax errors when creating complex conditions. Colored highlighted syntax in SQL editor. 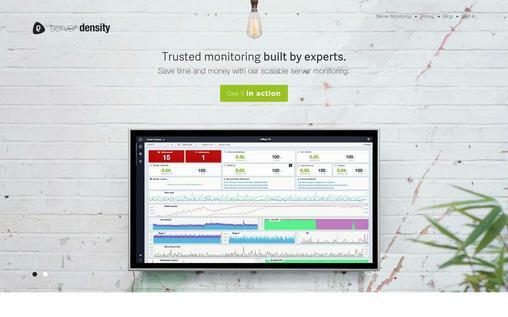 Database monitoring facility for locks, Tablespaces, Buffer pools, Table Stats, Utilities, DBM and DB stats, etc. Can use to work with 32 Bit or 64 Bit ODBC drivers. 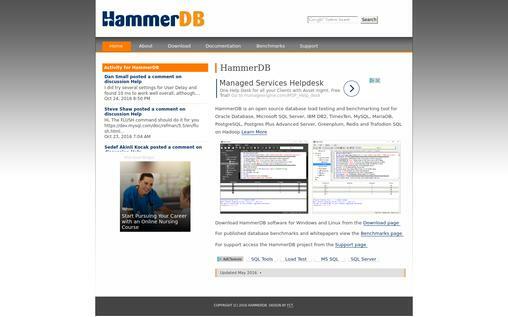 HammerDB is database load testing and benchmarking tool supports to supports Oracle, SQL Server, DB2, TimesTen, MySQL, MariaDB, PostgreSQL, Greenplum, Postgres Plus Advanced Server, Redis and Trafodion SQL on Hadoop. Industry-standard benchmark inbuilt transaction and query-based test. Support to Microsoft SQL server. Workload replay and Bespoke load test. Possibility to analysis database performance. Data sourcing with direct database connection. Possibility to install as the standalone application. Possibility create the Database instance with a single click. Indexed access avoid slow execute queries. Store and retrieve key ranges with enabled flexible data modeling option. Simple steps to create transactional branches for various reporting, development and testing purposes. 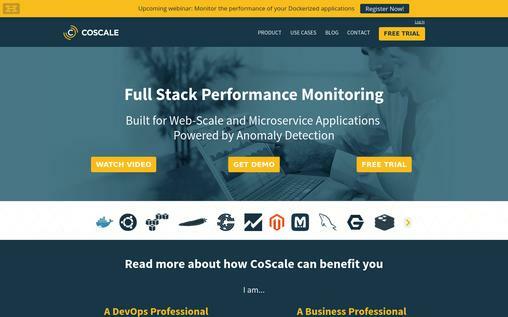 CoScale is a tool that design for database performance monitoring and optimizing purposes of large-scale industries. Shared key performance indicator window with all relevant parties like operations engineers, web developers, digital marketers, and business managers. Servers and applications monitoring facility always keep eye on critical parameters and generate early alerts for preventive actions. Real-time end-user performance monitoring to make sure the actual performance experienced by the users. Automatic monitoring of abnormal behaviors of database and fault detection. Keep in the track of technical performance drop during the technical and business events. Report generation facility with all performance measures. Administration dashboard with role base permission assignment facility. Easy to use without coding knowledge. 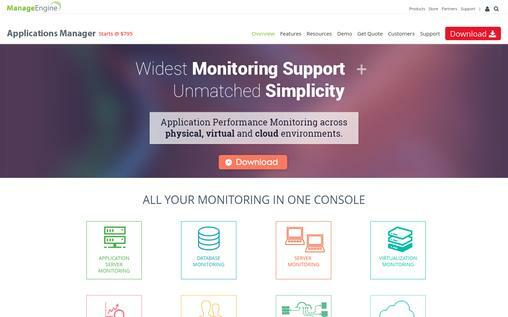 Full stack application monitoring via plugins. Lightweight application and optimized to use in production environments. Server Density is the online cloud infrastructure dashboard facilitates to manage the performance of the system and monitor risk levels. Advanced server monitoring alerts facilitate early attendance to an issue before it affects to the system and its users. Own graphical dashboard provides the complete picture of the performance of servers and clusters. 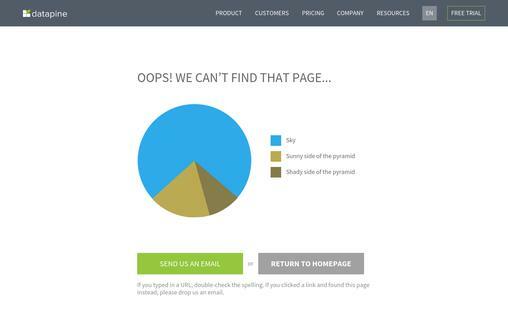 Visible to most of the cloud service provider networks. One way data post and no any send back data from Server Density to database happens. There is no any risk on remote execution. The system uses standard HTTPS port 443. There is no need to open a new port to work with Server Density. Data transfer is handled with industry standard HTTPSencryption and non–encryption communication is not allowed with the system. The code is freely available since the Server Density is open source application. Multifactor authentication prevents the guest access to the database though Server Density. Server Density is hosted in secured and reliable data centers with all facilities like multiple redundant power feeds, carrier neutrality and 24/7 on-site security. 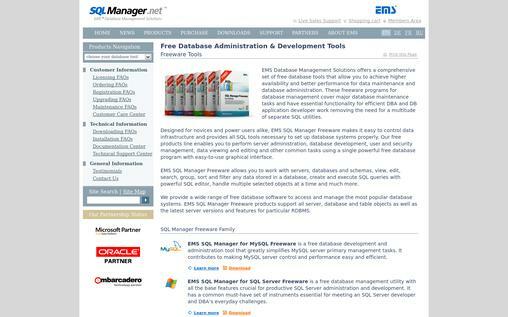 EMS Database Management Solutions is integrating with a number of components and create unique data analysis culture specific to the user requirements. Vendor independent solution available that cater the management activities for all available databases. Facility to monitor the system performance and generate notifications for preventive actions. Essential functionalities to Data Base Administrator and database developer to work with existing databases. Provides all SQL tools to setup database system properly and perform maintenance work. Facility to set up multi-level permission set allows defining access permission according to the role and system access requirements. Inbuilt powerful SQL editor facilitates to create and execute SQL queries easily on data stored in the database. Possibility to handle multiple database objects at a single time. When considering all the above database management software, primary attention is on monitoring of the system performance and generate alerts on each issue that affect the system availability and end users. Also, the focus is on to create complex SQL queries in the simple graphical way and make the possibility to use the system for a person without deep technical knowledge on database scripting. Special permission sets need to change the data or the structure of the existing database and all the systems facilitate to have DBA access and user access separately depend on the role of the user. In the case of the end user access only encrypted one-way communication is established with the tool and database to make sure there is no any unwanted data change or any unauthorized access to existing data.